Project type: Rear extension and bathroom renovation. Floor construction: concrete (screeded with sand cement screed) floor throughout with pipe clipped onto insulation. 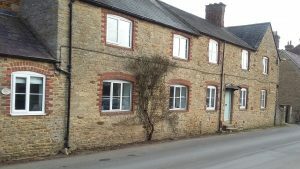 Pictures of a recent installation during the cold winter months, where the property wasn’t yet weather tight. 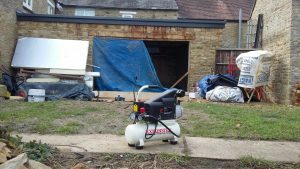 With doors and windows missing the only option for a pressure test was to use an air compressor and do an air test. We installed a German made 3-circuit Watts underfloor heating manifold, with a RWC mixer and approximately 200 metres of Henco RIXc 16 mm pipe. The maximum heat output from this underfloor heating system is approximately 3.5kW (12,000 BTU/hr). The amount of water inside the pipework and manifold is estimated to be around 21 litres. 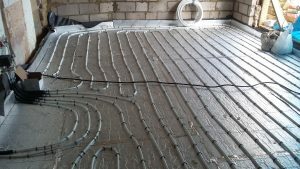 Underfloor Heating Systems Ltd always supply and install enough pipe even for screeded floors so that average pipe centres never exceed 200 mm cc. This is good news for all builders, plumbers and self-builders as the system will still perform in the long term future – even if existing boilers were later replaced by lower temperature heat sources such as ground source or air source heat pumps. Hence you should always get in touch with us before you purchase your under floor heating kit.